This post is sponsored by Shabby Apple. I'm a busy girl this week packing for my trips to Atlanta for Haven and to Hackettstown, NJ for the Enchanted Makeovers Gala. The suggested attire for the Enchanted Makeovers (EM) event is a black dress. EM is collecting dresses for the ladies staying in a nearby women's shelter that will be guests at the gala. 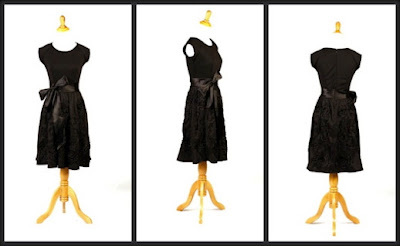 I gave my favorite black dress to EM hoping that someone else would love wearing it as much as I do (click here to learn more about the event). I'm absolutely head over heels in love with the Audrey Hepburn-esque style of this dress. I can't wait to wear it to the gala. Shabby Apple is a vintage clothing shop (vintage inspired). Their collection of retro dresses, swimsuits, tops/bottoms, shoes and accessories has my drooling over my keyboard. The "Boogie Woogie" is the most comfortable dress I've ever known. The top is soft cotton jersey material the the flowing bottom is silky sateen. I often incorporate vintage elements into my interior designs. I'm not a wardrobe fashion expert but I'm in LOVE with the idea of applying this concept to my wardrobe with more Shabby Apple pieces (click here to visit their online shop). I've gotta go…I must find my Grandma's pearls to wear with the "Boogie Woogie". I'll be sure to post lots of pictures from my trip to NJ. *I recieved a dress from Shabby Apple to facilitate this review post. All opinions are my own.